Our system is made considering Internal ControlIn applying the SOX Act, you can reasonably use the information system control procedures that the ERP system provides. Create accounting data based on such accounting information explicitly identified in business application systems as sales vouchers, purchase vouchers, inventory transactions, and accounts receivable transactions. Carry out balance reconciliation for data at the end of the trial balance accounting period, including the accounting data balance for audit purposes created in the past accounting period based on sales-related modules (the sub-system control function). Provide balance details that always match the trial balance, including for the past accounting period for audit purposes, by the matching function and sub-system control function based on BS accounts of the trial balance. Ensure data accuracy of business application systems, making consistency control possible between accounting data and actual transactions as well as for the debit and credit balance. Perform such checks as credit, inventory allocation, and sales unit price divergence rate, which are incorporated as standard functions. Retrieve user’s operation histories per menu item in addition to the change histories of almost all data such as journal data and ledger accounts. The “i””in Plaza-i stands for “Integrated”.The Plaza-i system has several different sales order entry screens per business category, but they share one database, one sales order table, and one sales table. In addition to the standard sales order entry screen equipped with almost all functions such as distribution instruction, procurement deployment, and foreign currency transactions input, several screens per business category are provided since sales order entry is closely connected with your business. Also, it is possible to display or hide input fields or tabs as per segregation of duties by option. This is a simple screen specializing in quick issue of purchase orders for procurement as well as shipping instructions for goods in stock per sales order detail. 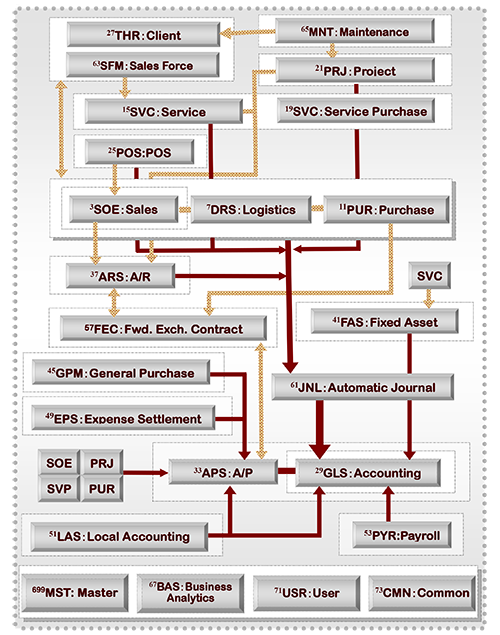 Procurement deployment, foreign currency transactions, and billing schedule are omitted. This is a sales order entry screen on which sales and billing can be defined separately for inventory-less businesses. This screen is specially designed for direct delivery sales from supplier to customer. Inventory transaction data is not created. You have both inventory item sales and trade sales. You are a merchandising business and yet you have long-term service contracts. You have billings processed on the closing date, at the time of each transaction, and in advance. You do wholesaling as well as retailing. You not only need inventory management but also project management. If you have a mixed business model, you may use different sales order screens, different entry methods, or do different master settings, and yet bring together the results of different business categories. Total management of accounts receivable is possible. Naturally, Plaza-i includes an Accounts payable module and a General ledger module that allow you to manage your business operations with a one-package system. Plaza-i can manage combined sales results from different business categories.